Mirror, mirror, on the wall. Where’s the cutest party of all? Right here, of course. 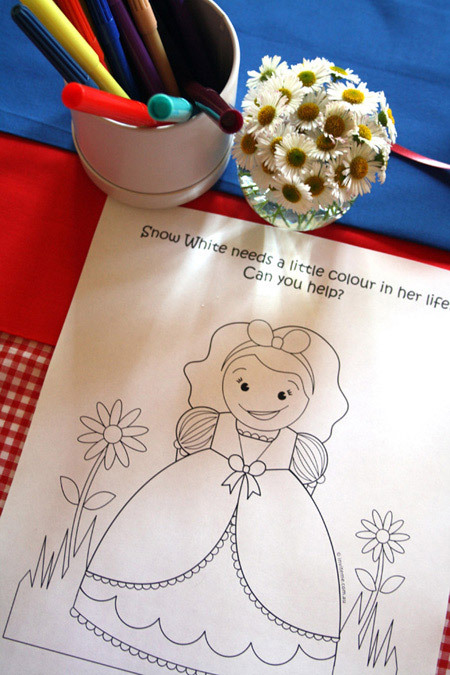 Come inside Tessa’s super-duper Snow White party. 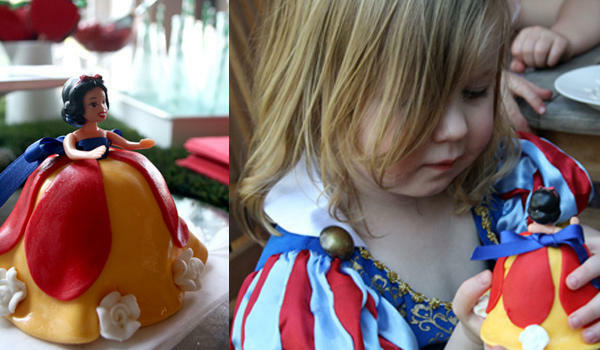 Mum Simone tells us is wasn’t hard to settle on the theme for Tessa’s third birthday celebration – her youngest daughter has worn out two Snow White costumes already and even the third is looking a little threadbare in spots! So a royal banquet it had to be, fit for a fair princess and her frocked-up princess friends. 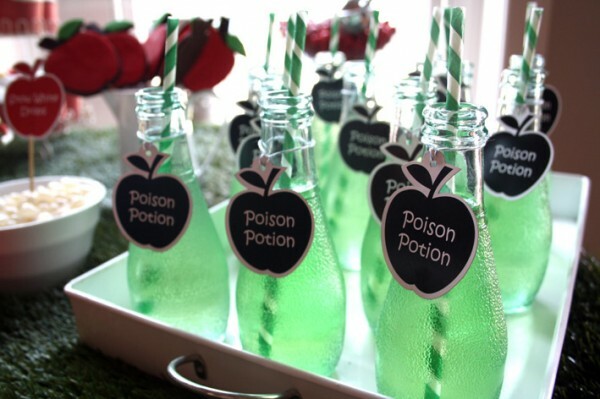 There’s so much more to love with this party, starting with the “poisoned” toffee apples and potions on the sweets table. 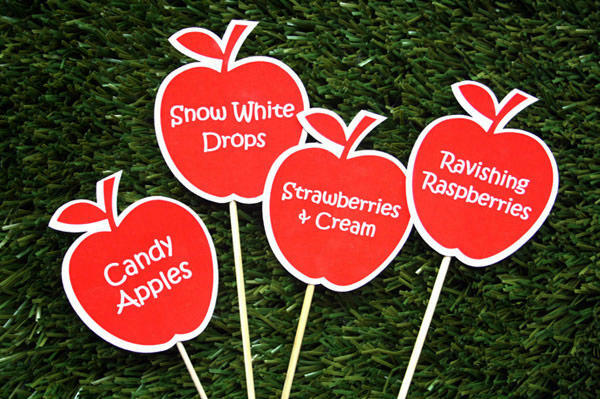 Anyone familiar with this fairy tale – and let’s face it, what mum with little girls isn’t – knows how crucial apples are to the whole Snow White saga so there’s apple-shaped biscuits and old-fashioned candy apple lollypops as well. 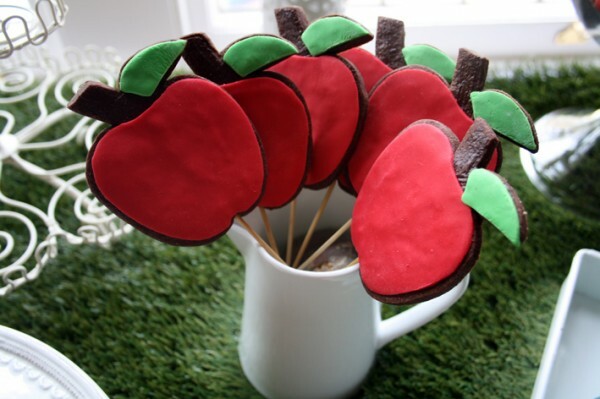 It wasn’t all sugary sweets. 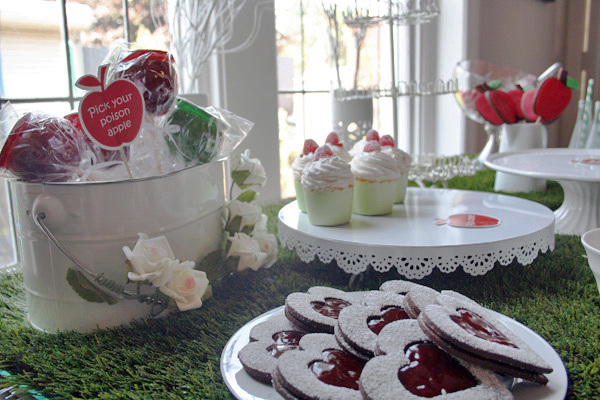 The preschooler princesses also supped on ‘forest fruit’ platters – Snow White had to eat something when she was hiding in the woods with the dwarves, after all – of grapes, strawberries and blueberries – alongside the impossibly divine floral-topped cupcakes and jam-topped love-heart cookies. And what of the birthday cake? There’s an old cliche that says the best things come in small packages, and that’s certainly true of this divine Dolly Varden-style cake from the delightfully named Cakes of Our Lives. 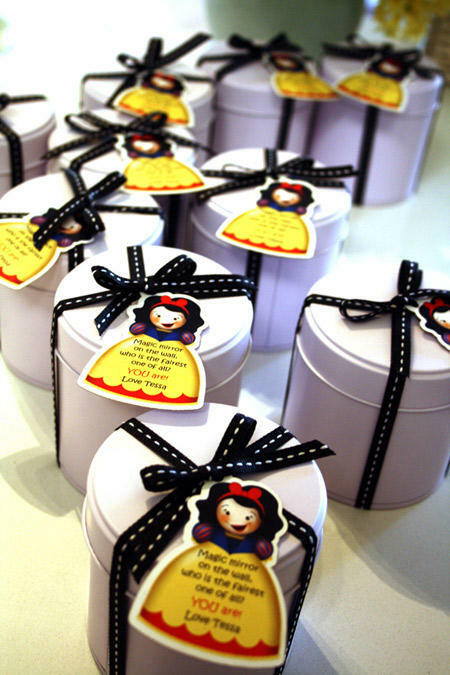 There’s more perfect little details too, like the smart silver tins used to hold the take-home party favours. 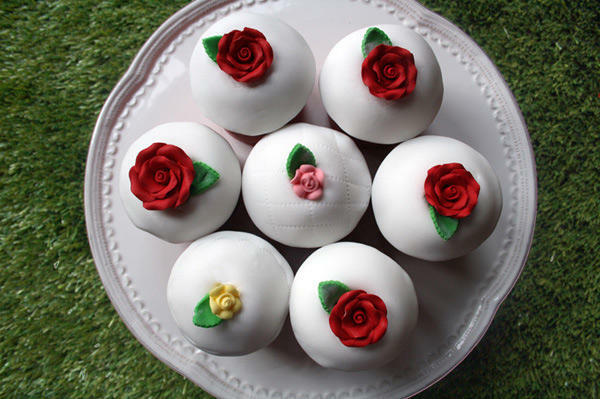 They came from Details, Details, as did the simple black and white ribbon adorning them and the green striped paper straws used in the potion bottles, while the pretty lace cupcake wrappers and tin cake stands came from Cakes Around Town. 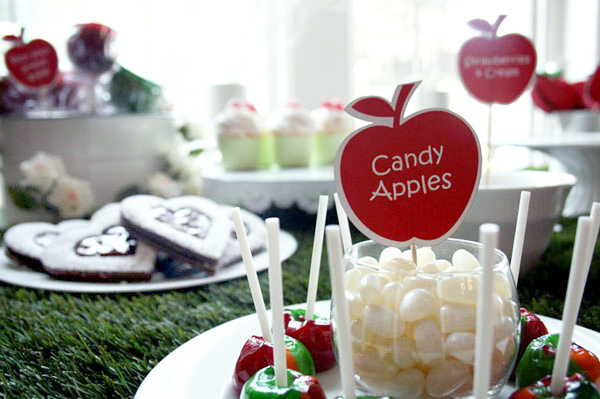 Want another great idea to copy that’s just the thing if you’re throwing any sort of woodland party – Simone dressed up the banquet table with an offcut of fake grass found at a Melbourne carpet store. See, we told you she was creative! 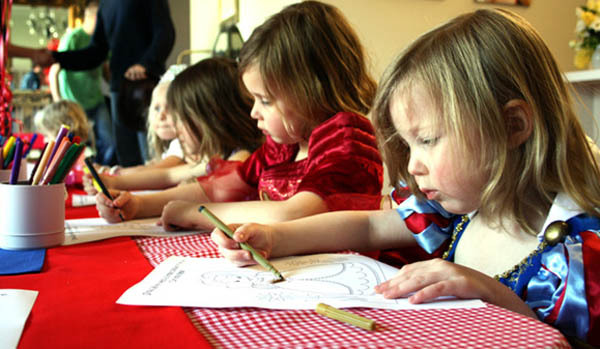 In between all that feasting, Simone kept the little princesses amused with a colouring table and party games including pass the poison apple, pin the jewel on the crown and a royal treasure hunt with jewels, tiaras, chocolate coins and other ‘royal’ trinkets as prizes. 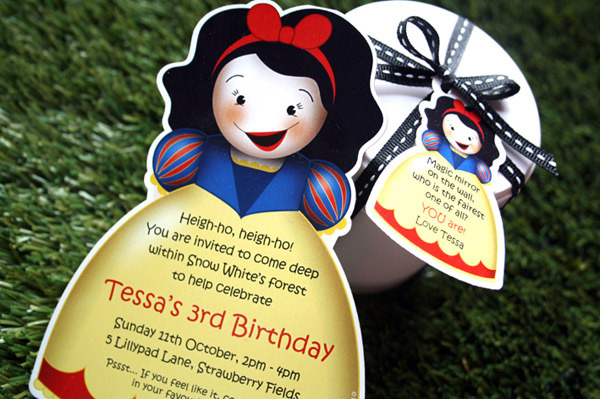 With a party this fabulous, we can’t help but think Tessa’s Snow White obsession is going to continue for quite a while yet!